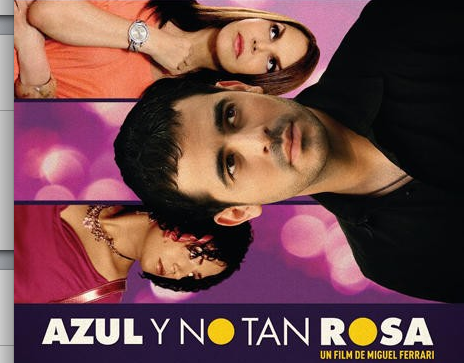 Azul y No Tan Rosa is the first feature of Miguel Ferrari, who drew inspiration from other filmmakers such as Pedro Almodóvar. He wanted to open a dialogue about homosexuality when he wrote the script. "In Argentina, they accepted homosexual marriage but not in Venezuela," said Ferrari. He mentions the subject is stronger with the riots in France after gay marriage was legalized and in Russia where gay propaganda is now punishable by law. Before its international premiere at the World Film Festival of Montreal, it played for eight months in the theatres of Venezuela. I understand why the Venezuelan crowd applauded and gave standing ovations, while whistling and screaming their content--it was certainly the most well-received film of the festival. Diego (Guillermo García) is a fashion photographer (Enrique Iglesias' double! ), ready to commit to his boyfriend, Fabrizio. Before he can, Fabrizio is viciously beaten by homophobes, which lands him in a coma. Meanwhile Diego's teenage son, Armando (Ignacio Montes), moves in with him. Armando is mad at his father for neglecting him since he left with his mother to Spain. The most intriguing character in the film is Delirio (Hilda Abrahamz), Diego's good friend. She is a transgender woman and a choreographer who also performs at the local gay bar. She dances, sings, knows how to use a gun or elbow her way in an event--she undoubtedly steals the show in the film. Despite being a drama with an important subject, it has its moments of comic relief. Diego's parents are hilarious, especially his father who is obsessed with a television show hostess and loves his grandchildren. Your website appears to be having some compatibilty issues in my chrome browser. I will shoot you over a screen grab of the problem. ????,????? CKM007 ??? ????? ?????? ASICS ?????? ????? ?